Wedding aisle runners and carpets. Aisle runners are perfect for making the bride feel special as she walks down the aisle or for a red carpet special event. Our standadrd runners are available in Red or White and are 10m long, we can supply other sizes to special order and we can also supply personalised runners. For that romantic feel and touch of class walk down the aisle on our white runner. 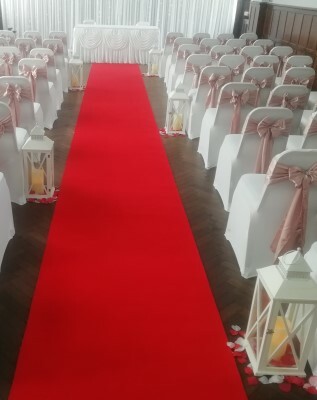 Feel special with a red aisle runner for your wedding ceremony or add a VIP Hollywood touch to your event or function. 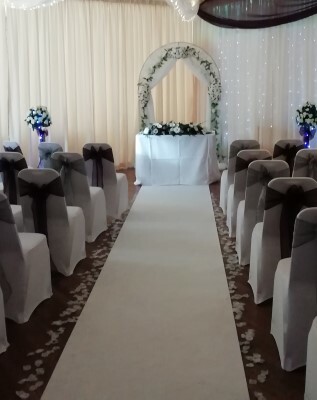 For that Rustic feel why not have our Hessian aisle runner for your wedding ceremony.